A little Scottish hill, but you need a head for heights! If you intend to tackle Stac Pollaidh for the first time, then read on. This wee tale is really how not to climb Stac Pollaidh (or Polly). The north-west of Scotland gains much of its bare and spare character from the improbable shape of the hills. They are, let's face it, a weird lot, but in a good way. The spectacular profiles of Stac Pollaidh, Cul Mor, Suilven and the others can stop you in your tracks as you journey here. 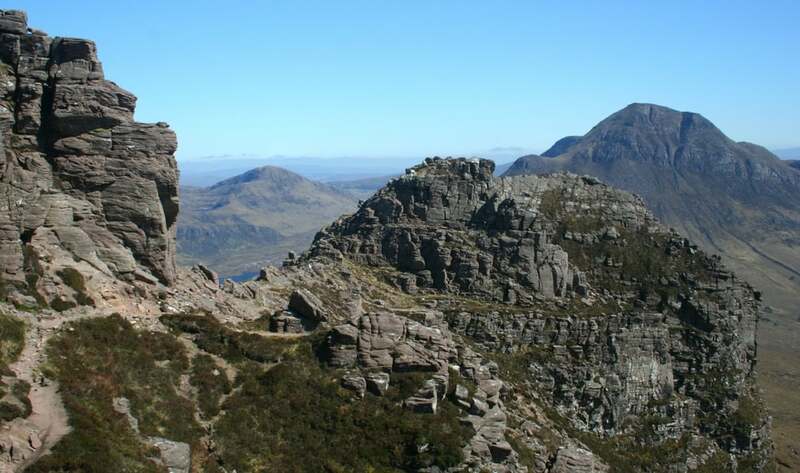 Sometimes, I've found myself explaining in guidebooks and brochures that they are Torridonian sandstone peaks that are all but eroded away; and that they sit on a plinth of tough and ancient Lewisian gneiss. This plinth or platform, in turn, has been hollowed and scooped out by glaciers over, uhmm, countless ages, and these hollows are now the interlaced lochs that are such an obvious feature when you look down from high points in the area. Och, maybe it's easier to suggest looking at the interpretative material at Knockan, north of Ullapool, within the designated North West Highlands Geopark. (Pictured here) The summit ridge of Stac Polly, with Cul Beag beyond. Easy to reach, if you go the proper way, but all the top paths are eroded on this popular walk. Just take good care….and as it defintely counts as a 'proper' hillwalk, you might want to check out some gear - a decent pair of hiking breeks perhaps? With a seaboard open to prevailing Atlantic south-westerlies, here you can sometimes have days of low cloud and rain, so that you never see the tops. On the other hand, it can be magical. To help you get to the rocky fun at the top, these days there is a very well-constructed path (which I don’t remember from my youth), lacking only an electrically operated stair-lift for the less fit. This path takes you round to the shady side of the hill, then up to the col at the eastern end. There are spectacular views over the Coigach peaks southwards, the Assynt hills to the north and the big Beinn Dearg Group, uhmm, over there somewhere. So far, so good; and if we’d all stopped at that point, then that would have been an easy half-day rewarded with a sensational panorama. But only Johanna decided to stay on the col with the dogs, sensible girl. Oh no, memories from my impetuous youth of sauntering over the loose stacks and pinnacles drove me on, in the company of another tourism professional but self-confessed novice mountain scrambler. We went all round the hill, below the crags, and had a real close-up of how fast the sandstone pinnacles are eroding. Cul Beag and Loch Lurgainn from the top of Stac Polly. (Pictured here) Cul Beag (the mountain) and Loch Lurgainn (the water) from the top of Stac Polly. The road to Achilitibuie and Reiff is just visible by the edge of the loch. (Pictured here) Are you quite sure this is the usual way up Stac Pollaidh? Actually, no. Moral: never follow a chap trying to recapture his fearless youth. And at this point, I’m a little sheepish, because, near the west end of the hill, to get to the very top, we committed ourselves to a steep and very loose gully topped by still smooth-faced Torridonian sandstone: a little too near the vertical for a casual stroll. I suppose it was what the climbing guides call an easy scramble. We were blessed with a beautiful day and had plenty of time – yet we went the wrong way to reach the top. It was just a wee reminder that Scotland’s hills demand respect. (This little hill has been the site of serious accidents). Stac Pollaidh is not a Munro (a 3000ft / 914m peak in Scotland) – but for spectacle and entertainment it beats many of them. Visit soon, before walkers’ boots and natural erosion level it completely! You could tackle Stac Pollaidh as part of this Vikings-themed tour of Scotland described on the link here. But check out the Highlands weather first. After your day on the hill you might be able to grab a bite to eat in Achiltibuie.